The first dance is often the last ‘traditional’ bit of a wedding and the majority of couples I have photographed really don’t like the first dance, they don’t like the attention it brings but I always offer the same advice to every couple; start off with just the bride and groom and then after a minute or so, start to grab other couples and get them up on the dance floor and before you know it, everyone’s up, joining in and the happy couple can relax! The first dance can be very challenging to photograph, its often dark, dark and really dark! I often use off camera flash for the first dance – but you have to really make sure that you don’t kill the feel of the moment and that you are only adding in flash to add a little light to the couple and not to light the room. I will always speak to the DJ and ask them for the first dance to try and turn down the rave lights, most will turn off the overhead lights that bounce around the room, but some just forget so you have to make do! 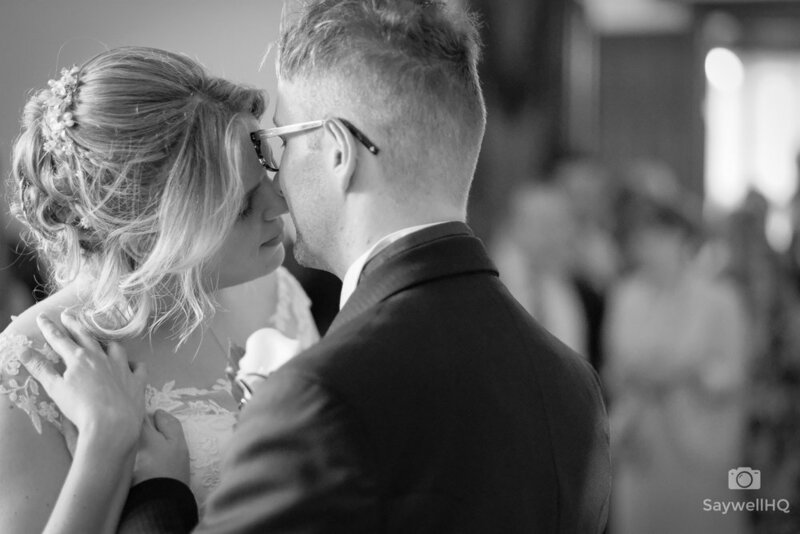 The shot below is my favourite first dance shot and was taken at the wedding of Jack and Sarah – I love the depth to the picture. Whilst the first dance is going on – I am always on the lookout for people’s reactions, some are good and some are bad…. Let me expand on that; often people watching the first dance will be happy for the couple and you can see it in their faces and that comes across in the photos – just like this picture. I do love a good first dance and here are some more!